Shaft is fixed on both ends. On one end shaft can’t move. On second end shaft can move in one direction. On shaft are mounted two different circular plates. Every circular plate is described by its radius. External forces work on specific points of plates. Subject of example is to designate equilibrium equations. 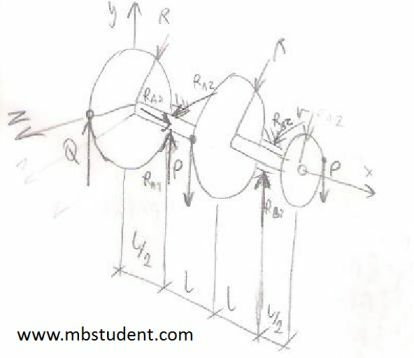 Next step is to plot characteristics of shear force, bending torque and torsion torque at whole shaft’s length. As final result the minimum diameter of shaft that provides enough strength it’s calculated. Shaft is fixed on both ends. On one end shaft can’t move. On second end shaft can move in one direction. On shaft are mounted three circular plates. Two circular plates are the same. Every circular plate is described by its radius. External forces work on specific points of plates. Subject of example is to designate equilibrium equations. Next step is to plot characteristics of bending torque and torsion torque at whole shaft’s length. 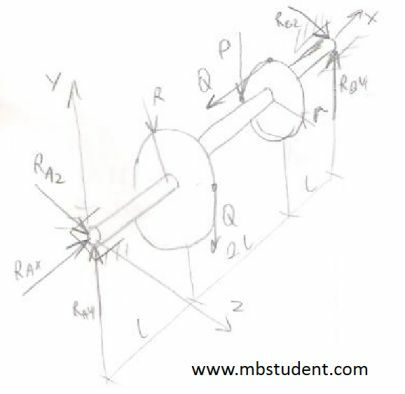 As final result the minimum diameter of shaft that provides enough strength it’s calculated.